When I started blogging in January 2009, I never thought it would last this long. I chose to blog about the Internet café business in the Philippines and aimed for the always online i-café owners as my audience. At first, I was grasping for topics to write on and was a bit tentative on many of them. I wrote about many subjects and there was a time a fellow blogger, whom I requested to review Owning a Café, made an advice to narrow down the topics of my discussions and just focus on i-café business. I took the advice and concentrated my blogging to topics about i-café business variables, computer software and hardware technology updates that apply to i-cafés plus news and events concerning the industry. A) I-Café Pilipinas Main – The site contains the announcements of events, news about the i-café industry and statements of the organization’s positions on various issues affecting the business of providing internet access to the public. B) I-Café Techniques – The rules and regulations in the registration and operation of an i-café, success stories of the players in the industry, briefs about local i-café associations and business tips and tricks can be found on this site. C) Ang Digital Batang Pinoy – Containing article in Filipino, the site is the initiative of I-Café Pilipinas in advocating for the right use of technology through education especially the online protection of the young people accessing the web. D) Usapang I-Café – Intended to contain the discussions among i-café owners, this Facebook look-alike site automatically have the excerpts of the articles from I-Café Pilipinas websites. Members can reply to the topics as well as post their own updates on their feelings and activities. From the above, you would readily see that most of the topics that Owning a Café have in the past are now delegated to the above-mentioned sites. 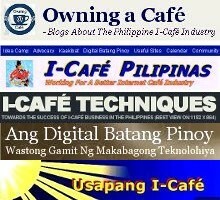 As such, this blog now contains only technology updates and my personal comments and opinions on current issues about the i-café business in the Philippines. I hope you will continue to patronize this blog as well as my other sites described above. Hi, I’m so blessed to know that there are many Pinoy internet cafe owners who are joining their forces together to help one another. I know prosperity is yours. .-= Carmen Araneta´s last blog ..Pinoy Professional Drivers- Licensed to Kill or Inflict Harm? =-. Thank you for your comment, Carmen. Yes, there is a strong initiative among concerned i-café owners to unite and work for their empowerment as a group with the goal to help one another. .-= EdZee´s last blog ..About Computer Stress Syndrome =-.